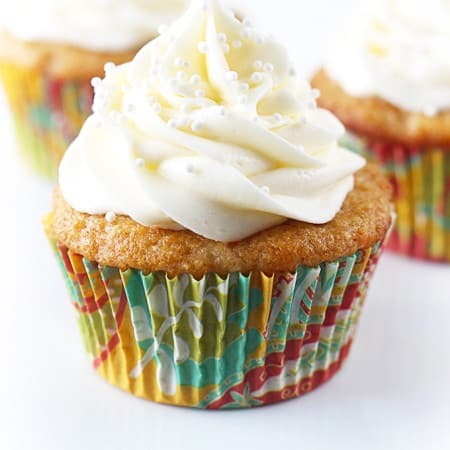 These cupcakes are made moist with crushed pineapple and greek yogurt, baked to fluffy perfection and topped with a rich cream cheese frosting to die for! Preheat oven to 325 and line muffin tins with cupcake wrappers. In a large bowl combine carrots and next seven ingredients and mix with a hand mixer until smooth. In another bowl whisk together flour and next five ingredients. Add dry ingredients to wet ingredients and mix until just combined (don't over mix). Pour batter into prepared pans, filling each wrapper about 3/4 full. Bake 20-22 minutes until an inserted toothpick comes out clean. Allow to cool completely. In a large bowl cream together butter and cream cheese until fluffy (2-3 minutes). Mix in vanilla. Add powdered sugar one cup at a time until frosting reaches desired consistency (for piping I suggest closer to 4 cups for a stiffer frosting that will hold up). Spread or pipe onto cupcakes. Top with sprinkles if desired. Store in airtight container at room temperature.